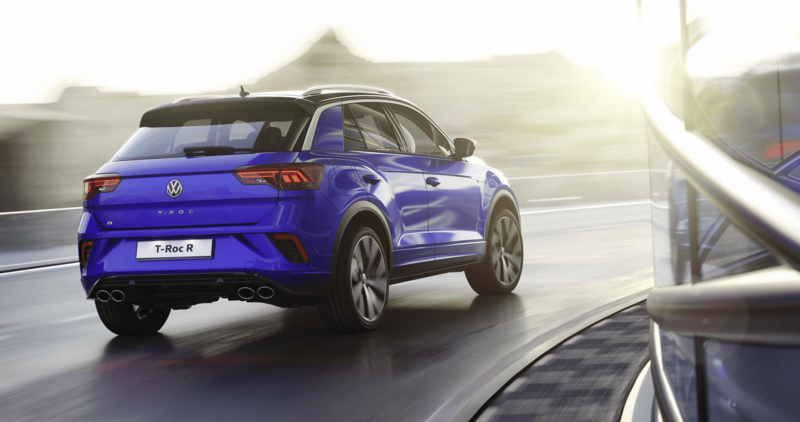 Joining the Golf R, Cupra Ateca and any number of other platform-sharing models in VW Group’s broader portfolio, reports Iain Robertson, is a zapped-up, four-piped, spatted and bespoilered version of VW’s junior-league SUV, the T-Roc R.
Tempted to go overboard in paroxysms of critical disbelief, for VW to release the details of yet-another-bloody-hot-SUV is starting to verge on the ridiculous. While it is abundantly clear that VW owns enough individual badges/marques, upon which it can impress its corporate messages, I cannot help but feel that introducing another hot variant using the same hardware as the rest of them is not merely a waste of money for the manufacturer, as well as the nominally brand-blind consumer, but it also displays a comprehensive lack of enterprise, on design, engineering and marketing fronts. I would venture to suggest that hotting-up the T-Roc, itself a virtual bridge-too-far, is now truly taking the piss. Allow me to let you into a little ‘secret’, VW’s management is currently in one of the most confused states ever. It has been trying to assess what is happening to the world motor industry but has not been arriving at a clear solution. Despite all of its combined expertise, its undying desire for high quality in its products and its world’s largest carmaker status, VW Group has become the uber-arrogant behemoth that wants to be perceived as vital but cannot be, because it is simply too darned huge. In fact, its corporate bulk is dulling its competence. Its product planners lost the plot ages ago. Its designers, particularly in relation to its four main brands, Volkswagen, Audi, Seat and Skoda, have become as lazy, if not more so than Messrs Callum and McGovern from JLR. Remove the grille badges from any of the recent crop of VW Group models and you will be hard-pushed to determine which is which. Developed by Volkswagen R, which is apparently VW’s ‘performance arm’, this punchy performer boasts typically impressive figures. Its widely-used 2.0TSI engine develops a familiar 297bhp, with torque set at 295lbs ft. It drives all four wheels through a 7-speed DSG automated-manual gearbox and blitzes from 0-60mph in 4.6s, with an electronically limited top speed of 155mph. Yet, this is not even ‘news’. It is a recipe regurgitated with nothing other than enhanced profitability in mind. While I have nothing against car companies earning a crust, when their sole aim is to recover the huge costs incurred by their misdeeds on the vehicle emissions fronts and to make their customers feel the pinch, so that they do not have to, I feel that need to make critical comment. Lowered and beefed-up suspension is allied to progressive power steering that plays a major part in ensuring agile driving manners, while the 17.0-inch brake system that comes standard with the Golf R hauls up the T-Roc confidently. Because it’s an ‘R’, it apparently needs the ‘race mode’ setting in its configurable armoury, although how many owners will indulge their race, or rally, start procedures with the launch control function remains in doubt. However, that same ‘sporty’ suspension set-up that only works strictly on the smoothest of Teutonic tarmac, does not work with the increased body height and raised centre of gravity dictated by the SUV category, let alone employing even a whiff of its potential on broken British roads. Yes, it is probably immense fun for car-nicking 18-year olds wearing backward-facing baseball caps, or car company executives seeking thrills, for very occasional moments of motoring lunacy, but they do not have to worry about the funding options. This car carries a hefty premium over its lesser variants. The exterior of the T-Roc R lords some detail differences over its more conservative counterparts. The specially redesigned radiator grille has a shiny band of anodised aluminium on its underside that runs the entire width of the vehicle. The R logo can be seen clearly on the radiator grille and it is mirrored by a specific styling strip that runs over the side panels and doors. The bumper possesses a sporty design and is painted in body colour. Vertically arranged daytime running lights are integrated into the front bumper. However, all of these are parts-bin details that, in reality, cost little more than the stock items they replace. T-Roc R is equipped with 18.0-inch diameter Spielberg alloy wheels, with 19.0-inch Pretoria dark graphite matt alloys, clad in 235/40 R19 tyres, available as an option; matt chrome mirror caps, a roof spoiler and extra door trims, the skid plate painted in an accent colour, black embossed and widened wheel arches, are highlighted with black brake callipers and an R logo. Paint finishes are colourful and the roof panel can be painted black. The sporty characteristics are carried into the cabin. Upon opening the driver’s door, the eye is drawn to the stainless-steel sill trims and the R logo stitched into the seats. The foot-pedals are in stainless-steel. Typical high-grade VW quality is much in evidence, with perfect stitching and soft-touch tactility all around the interior. 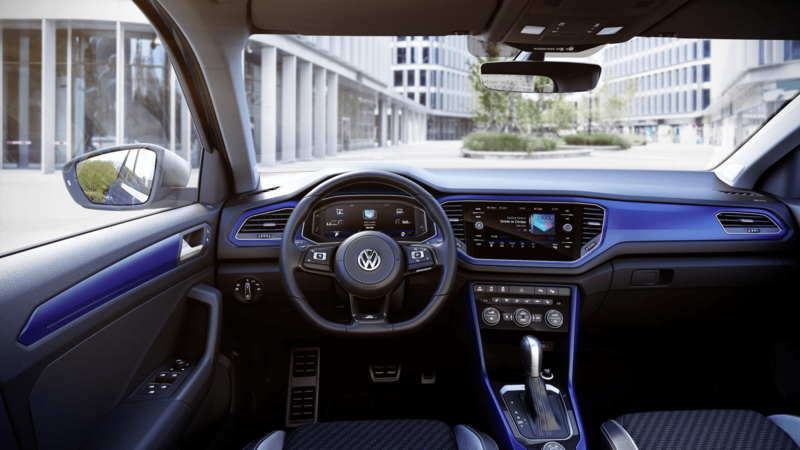 Dipping into VW’s extensive (and expensive) options catalogue goes without saying and the car can be configured and personalised in hundreds of different ways. Some of them include an elegant leather package, carbon trim inserts and even a marginally more raucous Akrapovic titanium exhaust system. 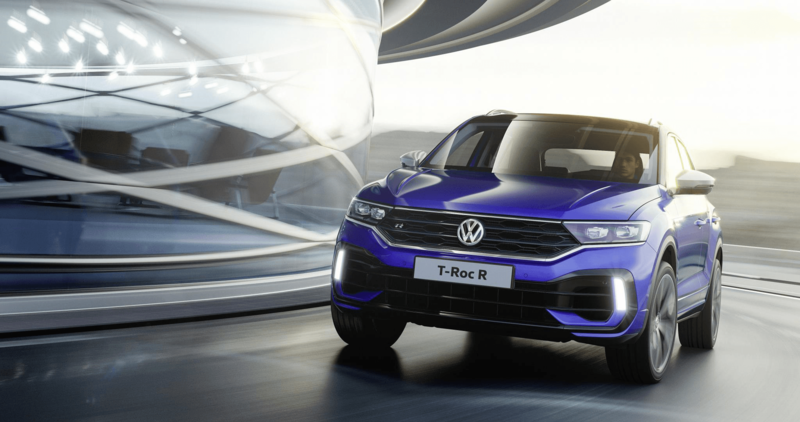 Volkswagen expanded its SUV range to incorporate the T-Roc back in 2017, featuring crisp dimensions outside, with customer-pleasing functionality inside (it says here). 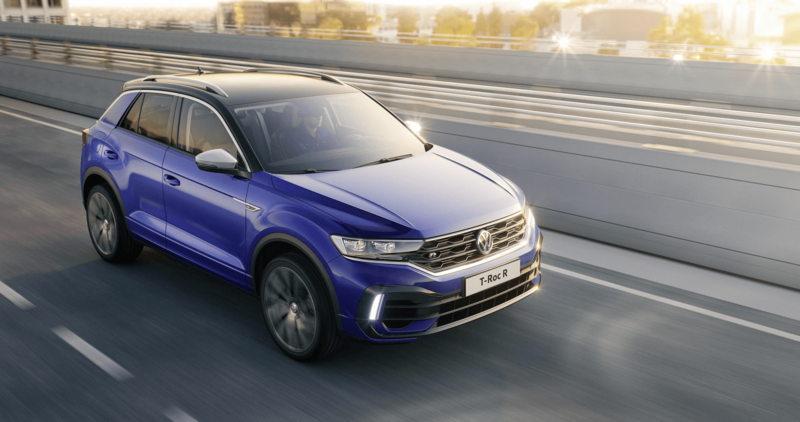 T-Roc is just as ‘at home’ in a city environment, as it is blatting along motorways, or tackling your favourite back-doubles, if you can tolerate its unforgiving ride quality. Prices will be announced nearer to the car’s on-sale date, sometime in late-spring and you can expect a hefty premium for the R version, over the already premium-priced regular T-Roc. Conclusion: It would be perfectly understandable to become confused by VW Group’s flexing of its corporate muscles. Another R model simply adds to it. Our typically neutral advice would be to assess which of them meets your needs best and then compare the bottom-lines. I can assure you, if you feel R-inclined, despite the cross-brand price parity, wait until a hefty discount is offered, it will not take long.